How to remove old kernel versions? How can I remove old kernels after upgrading to a new version? It is annoying me to have these kernel entries in the Grub boot menu. 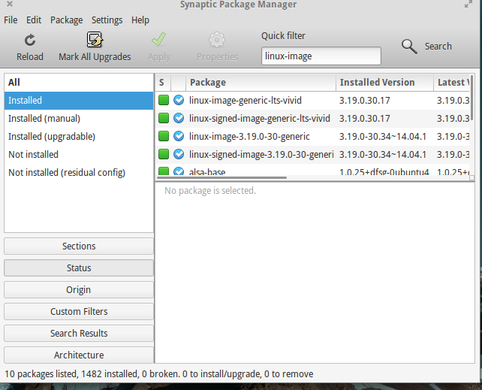 Never remove the kernel shown in uname -r or linux-image-generic-lts-utopic. Finally sudo apt-get purge <package names> for the kernels you want to remove (see screenshot for reference). Then sudo update-grub to update the Bootloader. What it does is uninstall (apt purge) the installed packages (dpkg --list) whose names match "linux-headers-[number]" or "linux-image-[number]" (grep -P -o "linux-(headers|image)-\d\S+"), except (grep -v) those corresponding to the current kernel version (uname -r | grep -P -o ".+\d"). 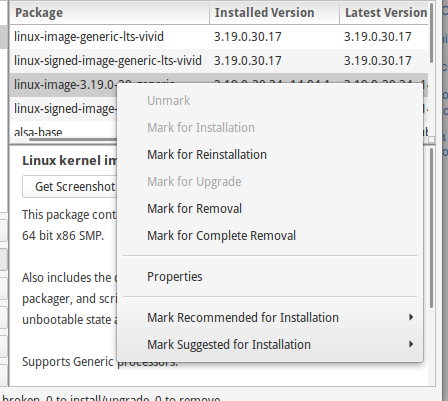 to "remove all unused packages" which includes older kernels. You should test a reboot before to be shure the new kernel works! It is more secure to leave the 2 latest versions as John pointed out in his answer. Note: Screenshots are only examples from my system.I already deleted old kernels.Please select old kernels as per your system. Note: In general to remove old kernels use linux-image-x.x.x-x where replace x with numbers. Note: you can verify deleting kernels with following command-here the output excludes current loaded/running kernel .So please boot to latest kernel. Not the answer you're looking for? Browse other questions tagged kernel updates or ask your own question. One of my apps has a second, fuzzy icon in Plank. How can I workaround this? How do I avoid Kernel 3.19 updates? What are the effects of a custom kernel? How to repair the system after an accidental deletion of the kernels?